There is not a real Chinese who does not like noodles. Seriously. Ask around. Do a poll. Chinese + noodles = a match made in heaven. Frying noodles is really as easy as ABC. Added to that, you can use any ingredients you like or happen to have on hand. I like my noodles with some sort of meat, one or two types of vegetables (I have discovered that kids will eat all the vegetables if I cook them with noodles) and egg in some form or other. 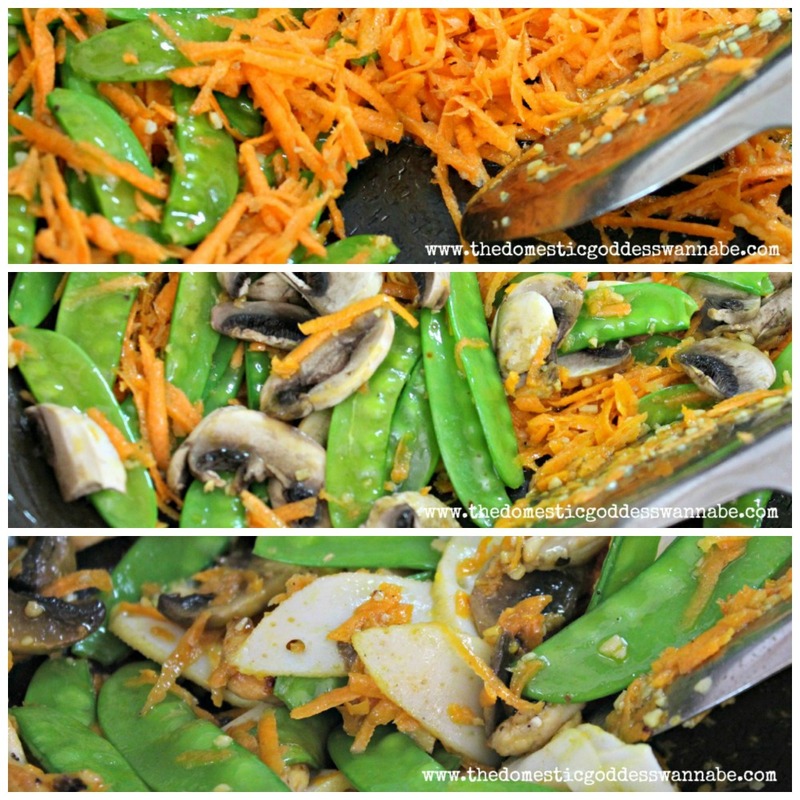 Today I am using chicken, carrots and snow peas. And eggs, of course. 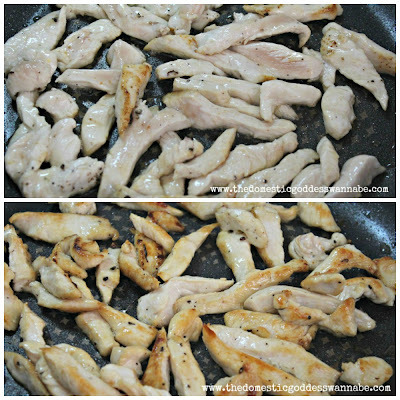 I sliced half a chicken breast into strips. Into the chicken, I added some salt, pepper and a little corn flour. I pan fried the chicken in a little oil in a skillet. Once browned, they were placed on kitchen towels to drain and set aside. In the same skillet, I added a little more oil and fried half the egg mixture into a thin omelette. Then I repeat the same with the remaining egg mixture. Once cooked, the omelettes were stacked together on the cutting board to cool. When the omelette had cooled, I rolled them and then finely sliced them with a sharp knife. This was then set aside. At this stage, I soaked the egg noodles in boiling water for about 3-4 minutes to soften them and once they were relatively soft (not soft, soft since they would be fried later), I drained them and set them aside. In a heated wok, I added some oil and the minced garlic. I fried the garlic for about a minute, until the edges started to brown. Into this, I added the shredded carrot and fried for another minute or so before adding the snow peas and the mushrooms. After another minute of stirring, I added the sliced fish cake and gave everything a few stirs. The chicken was added, as well as the salt and grounded white pepper. And then the noodles. Continue to stir to mix, and once everything was well-mixed, the dish was done. I placed the noodles in a bowl, topped it with the shredded omelette and served the noddles with some chilli and light soy sauce. 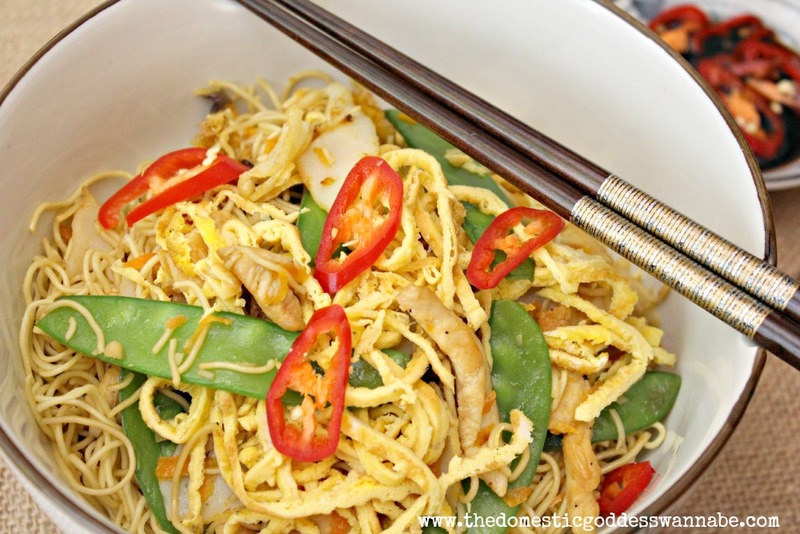 A bowl of fried noodles, any one? 1. 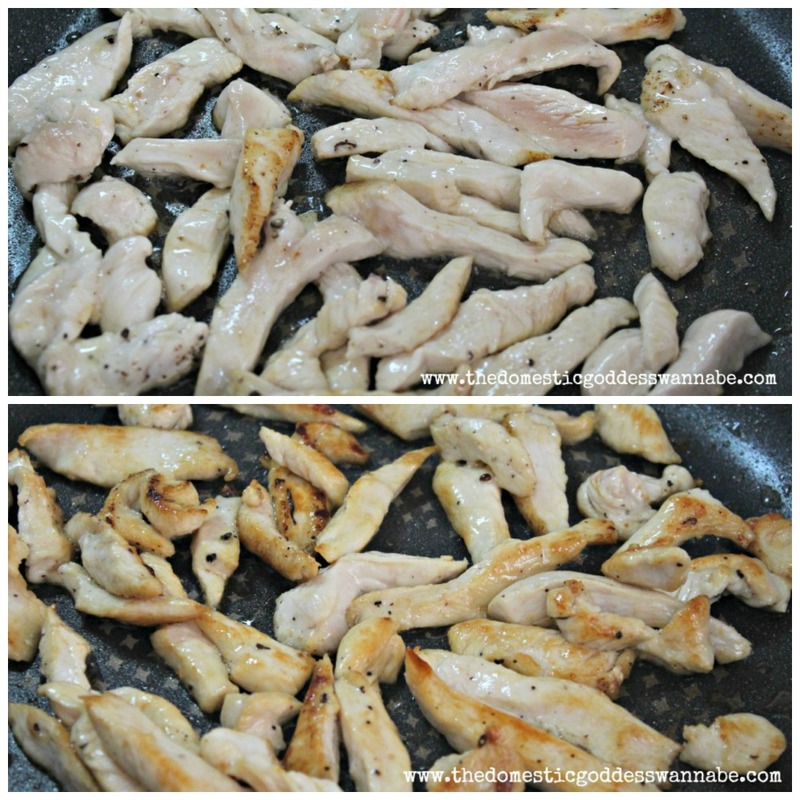 In a large skillet, cook chicken using about 1 tsp of vegetable oil until the chicken turns brown. Drain on kitchen towels and set aside. 2. In the same skillet, adding a little more oil if necessary, fry the egg mixture in 2 batches. Stack omelettes on cutting board to cool. Once cooled, roll the omelettes and slice thinly using a sharp knife. Set aside. 3. Soften noodles using boiling water. Once the noodles were relatively soft, drain and set aside. 4. In a heated wok, add vegetable oil and fry garlic until the garlic starts to brown. Add carrots and fry for about a minute or so, until the carrot starts to lighten in colour. 5. Add snow peas and mushroom, and fry for another minute or so, then add fish cake. 6. Once mixed, add chicken and noodles, as well as salt and grounded white pepper and toss to mix. 7. Serve noodles hot, topped with egg, and with chilli, if desired.